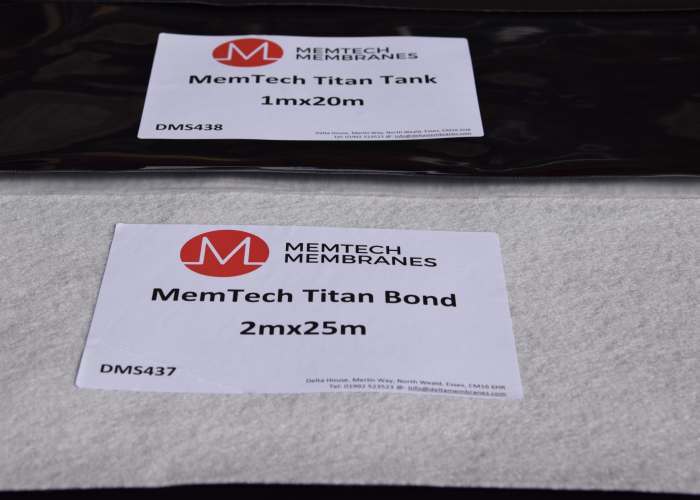 MemTech Pro Titan Bond is a pre applied waterproofing membrane comprising Memtech Pro Titan and a specialist bonded geotextile to provide a bonding layer for poured concrete specifically for waterproofing applications – Providing Type A Barrier Protection in accordance with BS8102:2009. MemTech Pro Titan Bond hydrocarbon and VOC barrier offers a safe solution for the protection of buildings and occupiers against all levels of hydrocarbon, VOCs, methane, carbon dioxide and radon gas ingress. Can be applied horizontally as well as vertically and is used in all applications where structures require protection against ground water, seepage, ground gas, hydrocarbons, VOC’s and other contaminants. Fully and permanently bonded pre applied composite membrane which not only waterproofs but protects against ground gas, hydrocarbons, VOC’s and chemicals. Acts as a damp proof and waterproof membrane as well as a hydrocarbon and VOC barrier. Designed to withstand the most aggressive environments.